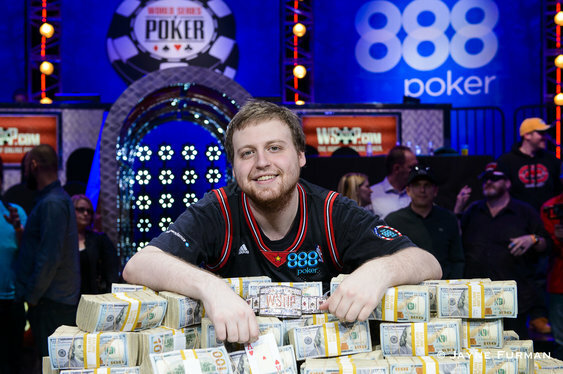 American poker player Joe McKeehen is now richer by over $7.683 million after winning the $10,000 buy-in main event at the latest edition of the World Series Of Poker (WSOP) in Las Vegas. The 24-year-old went into the nine-man WSOP final over the weekend at the Rio All-Suites Hotel and Casino holding a huge chip lead and did not put a foot wrong en route to claiming the coveted title last night. The Pennsylvanian started Tuesday's three-man finale with over two thirds of the chips in play and made short work of his final opponents. The first to go was Neil Blumenfield after his pair of deuces ran into McKeehen's pocket queens, which held to take the contest heads-up. It was long odds that Josh Beckley would be able to overturn a five-to-one chip deficit and so it proved. Just twelve hands into two-handed play, the chips hit the middle with Beckley's pocket 4s slightly in front of McKeehen's A10. A ten card on the flop changed everything while bricks on the turn and river gave McKeehen the hand, a maiden bracelet, $7,863,346 in cash and the life-changing WSOP title. Rarely has there been a more dominant WSOP main event performance than the show put on by McKeehen as he eliminated no fewer than six of his eight final table opponents. The win by the die-hard Philadelphia Flyers fan takes his career earnings to $9,772,256 and secures his place in the poker pantheon.